Apart from aesthetic reasons, does the colour of your roof really matter? It does, if the findings of a recent U.S. study are to be believed. 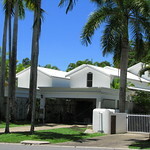 In an article written for RealEstate.com.au, Paul Thornhill says white roofs save money and are much greener too. Thornhill cites a report by the Lawrence Berkeley National Laboratory in the U.S. revealing that white roofs lower cooling costs during the summer months. In addition, a white roof can also reduce the greenhouse gas emissions of your property, which means a white roof is more environmentally friendly than all the other roof colours. Those who conducted the study found that roofs painted white are three times more effective at reflecting sunlight that black roofs. As it reflects sunlight more effectively, a white roof minimises heat build-up in roof cavities. This directly results to savings in cooling costs, estimated by the researchers to be at US$25 per square metre over a 50-year period. The findings of this particular study are quite interesting. Personally, I never was inclined to put up a white roof for my home because in my neighbourhood of mostly dark-roofed houses, doing that would make us stick out like a sore thumb. Then again, with that long-term savings a white roof is promising, I might just reconsider. How about you?